The NJOY Daily was launched in September 2015 as a follow-up to the very successful NJOY King. The product is claimed to be 90% as satisfying as a combustible cigarette during the first seven minutes. This is why it's known as 'Quick and Strong'. The design of the NJOY Daily represents a move away from traditional cigarettes. Whereas its predecessor (the aforementioned NJOY King) was designed to look exactly like a cigarette, the NJOY Daily E-Cig has maintained all the important qualities, ie soft filter and the mouth end, small and portable feel and great, authentic taste, the color and LED light have changed to reflect chaging perceptions of the disposable e-cigarette. 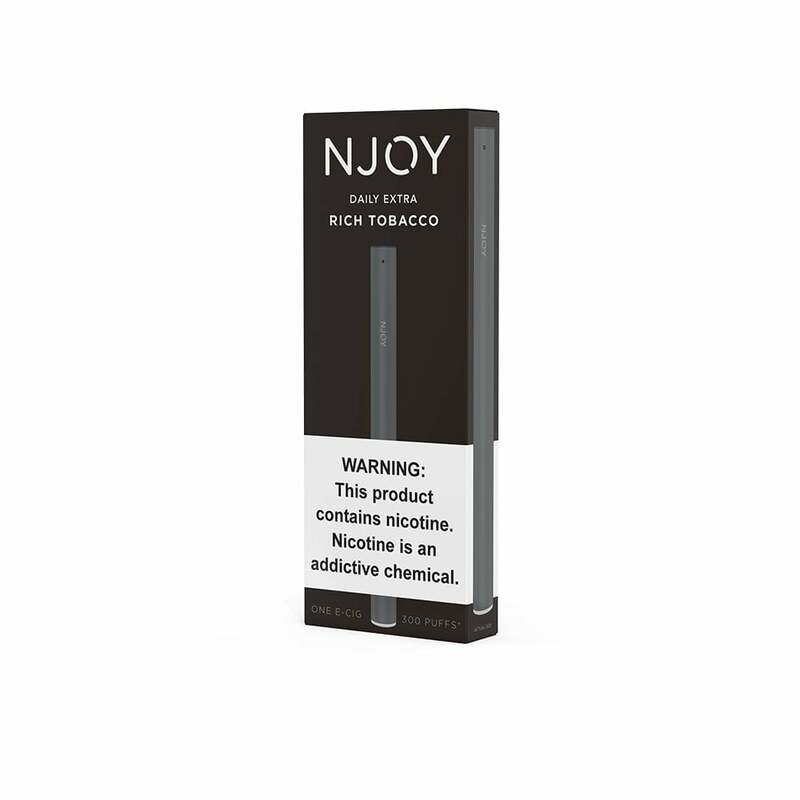 E-cig giants NJOY first rose to prominence because of their ability to replicate a pure burning tobacco taste in vapor form (not an easy task). The Rich Tobacco flavor is a new blend not seen before in either the NJOY e-liquids, disposables or flavor chambers ranges. It provides a strong throat hit, and when tested against the Vuse Solo E-Cigarette, four out of five people said they preferred the NJOY Daily E-Cig. I only trust electronic tobacco products when buying online. My favorite item I order weekly is the daily rich tobacco extra njoy disposable e cigarettes. They last 3 times as long as all others I tried and they taste great and are very well priced. I have tried many disposables and this by far is my favorite. The taste, feel and longevity of this e cigg is great so i always come back to this as my go to e cigg! These are good--just like smoking. But unlike other reviewers, I definitely don't think that they last as long as a pack! One problem--I have used many of them (100?) over the past few months with no problem, except with one of them. When I inhaled, the light glowed brighter than usual and didn't dim after I stopped inhaling. There was a crackling, sparking noise. The part that I was touching became very hot and left a temporary red area on my hand. I know that 'exploding' e-cigs are rare, but this was alarming. E. T. gave me a store credit, but otherwise wasn't very interested. The Daily rich tobacco extra disposable Njoys are great they last longer than they even say on 95% of them i get at least a full 24 hours out of one disposable and more than 300 puffs as well. I am a heavy user throughout the day as well so they are worth more than they cost, i would not even mind if they did cost a bit more i would still buy them. The vape is perfect that you get with these and i have not smoked a regular real cigg in over two years thanks to these. I have tried many other disposable e ciggs and this one is by far my favorite one. They last at least as long as a pack of regular cigarettes but are better for you and have no hassle of the smell of regular cigarettes. It died on me after 12 puffs, how do I get a refund? love how long these last and how they smoke its y favorite disposable yet! I wouldn't know how this product is customer service is so horrible I refused shipment on it and still haven't been refunded. If you wish to try this product I would definitely suggest ordering it from a different site. The ones that work are good but about 4 out of 40 or 10% don’t work at all. A++++ These helped me stop smoking cigarettes and for that I am very thankful. Great product. It has the hard hit feeling that cigarettes give and enough nicotine to take your mind off of the real thing. Please get them back in stock soon!